Even if you have an extremely brown thumb, you can probably grow mint. In fact, once planted, it is very hard not to grow it. Words like "aggressive spreader" and "invasive" are often used to describe this hardy perennial. If you don't watch out, it can take over your entire yard (which might not be a bad thing if you do have a brown thumb). The encroachment factor is easily remedied, though, as mint will thrive when grown in pots. Be creative with your containers; the mint in this photo is actually growing in a hollow section of a large tree stump that I filled with sheep manure and compost. Click here for a better view of the plant (and for some container gardening tips in the comments section below it). Speaking of remedies, mint is a must-have item in the herbal medicine chest. According to Rosemary Gladstar's Family Herbal, it is rich in vitamin C, beta-carotene, and chlorophyll. It is "stimulating to the mind and creates 'wakefulness.' Whiffs of the essential oil, sometimes even the tea, will improve alertness and awareness, so it's useful when driving, studying, and during times of stress. It is an excellent anti-spasmodic and is indicated for cramps and spasms. A terrific remedy for nausea, mint is recommended for travel sickness and some cases of morning sickness. It's also great for tummy aches in children and adults. The flavor of mint cleanses the palate and can be used to rinse the mouth after a bout of vomiting." 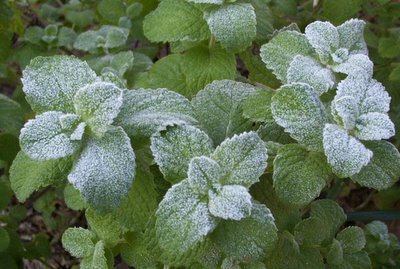 There are several varieties of mint, with spearmint and peppermint being the most common. Mint will grow from one to five feet in height and prefers wet to moist soil and shade to partial shade. I bought this mint plant last spring at the local Garden Club Plant Sale, where members dig up and divide plants from their own gardens and sell them to raise money for their organization. This is the perfect kind of place to buy your plants, as you know that they have been thriving in your climate. The prices are usually good, too. My mint plant (which was just a tiny thing when I bought it) cost me fifty cents. When I inquired as to what kind of mint it was, I was informed that it was "garden mint--you know, a combination of every mint." Okay. It smells like spearmint to me. I also procured a couple of pineapple mint plants for fifty cents apiece as well (along with enough other herbs and plants to fill up my entire car). I think I shelled out a grand total of about twenty bucks. The simplest thing you can do with your mint is to use it (fresh or dried) to make tea. Lemonade with fresh mint leaves is extremely refreshing. Recipes incorporating mint abound, but I confess I haven't ventured into the kitchen with my mint plants yet. Mostly I am content to tear off a leaf as I pass by a plant, crushing it between my fingers and inhaling that fresh, unmistakable scent (which is apparently stimulating my brain and calming me down). I just know it smells really nice. If you are interested in doing more with your mint than sniffing it, Kalyn's WHB#7 post offers links to several of her favorite recipes that incorporate mint. Weekend Herb Blogging, hosted each week by Kalyn's Kitchen, is a fun way to learn about interesting herbs & edibles from around the world while discovering yummy new food blogs. We'd love to have you join us. Just photograph and blog about an herb, plant, veggie, or flower and email Kalyn the permalink by Sunday afternoon (Utah time). The round-up of all the featured plants is published each Sunday night at Kalyn's Kitchen and is always a delightful and informative read. New to Weekend Herb Blogging? Catch up with these links to the last two roundups: Weekend Herb Blogging #7 and Weekend Herb Blogging #6. And remember--it's never too early to start planning next year's garden. I've already received two 2006 seed catalogs in the mail--and the Garden Club Spring Plant Sale is marked on my calendar. Hey, thanks for the nice comments about Weekend Herb Blogging. I am learning so much about different herbs and plants from doing this. Hope you had a great weekend, FG. I love those garden sales, too. Along with hardy local plants, I usually get great advice. The mint looks wonderful. I just wanted to let you know that your recipe for Whole Wheat Beer Bread was a hit with my family. I made it with a hearty ham and lentil stew and that was a perfect combo. Thanks for great recipe! Well, I guess I did just write about it! That's great news. And Hearty Ham & Lentil Stew sounds like an ideal accompaniment to the Whole Wheat Beer Bread. (Hmmmm. . .I will have to toss a ham hock into my next batch of lentil stew.) Thanks so much for taking the time to write and let me know.